Spray a 13 x 9 x 2- inch baking dish with nonstick cooking spray. Place baked, cubed potatoes in the baking dish and smash with a potato masher. Remove half of the potatoes and set aside for the second layer. Evenly spread the potatoes remaining in the baking dish so the bottom of the dish is covered. Sprinkle half of the salt, pepper and bacon over the potatoes. 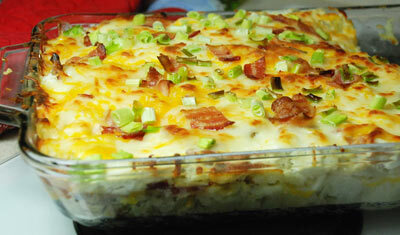 Top with half of the sour cream and cheeses. Add the remaining potatoes to the baking dish and repeat as in the previous layer. Bake, uncovered, for 20 minutes or until cheese is melted. Sprinkle with green onions and serve hot.